This beautiful French provincial house design showcases the formal style, grand architecture and country theme these homes are well known for. 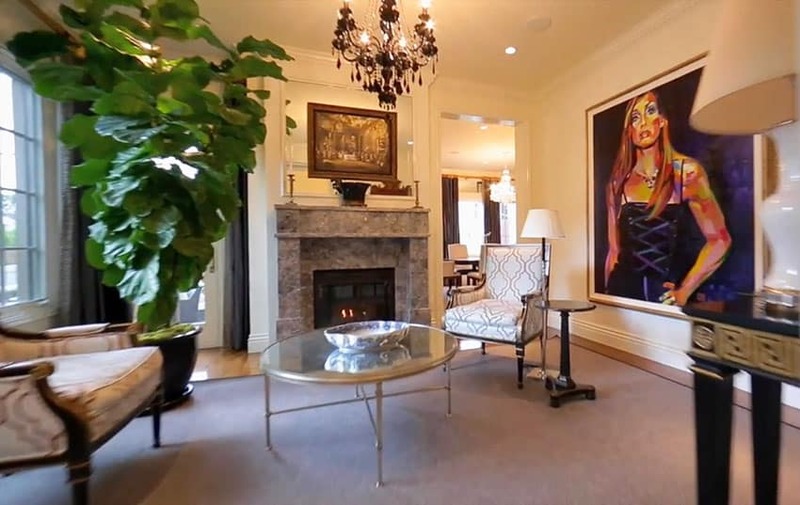 With 7 bedrooms and 9 bathrooms with multiple master suites and 10,000 square feet of living space this home is the pinnacle of style and beauty. The home’s French Country style shows throughout with gorgeous curved arches, intricate railings, and stonework. 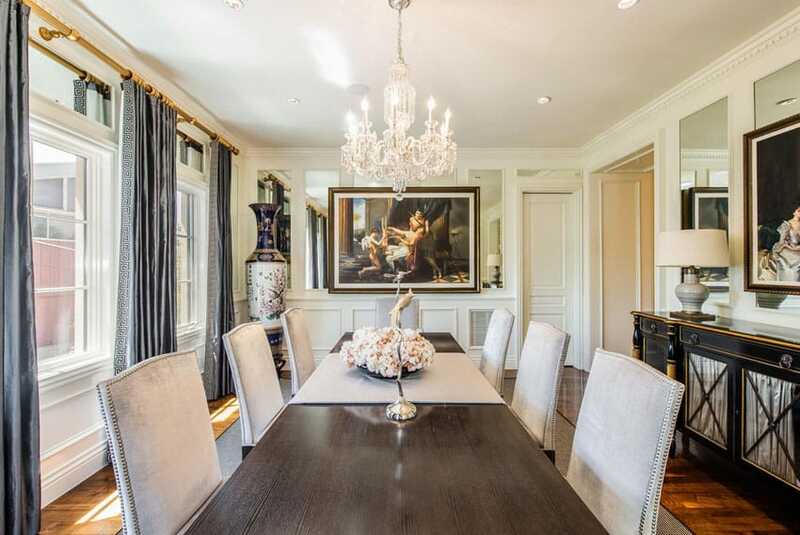 Custom created to resemble a European chateau this home features luxury throughout its design with elegant furnishings, rich detailed molding & wood work and meticulous detail. 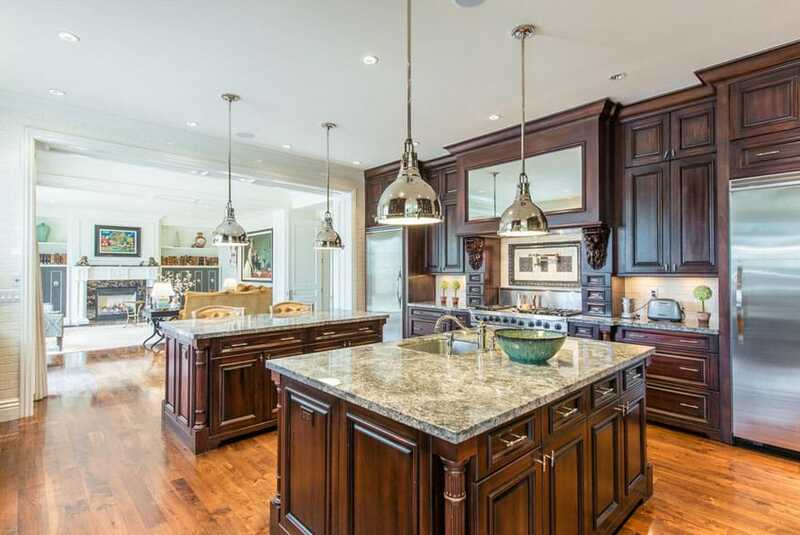 The large mahogany kitchen provides two islands with an eat-in dining area and opens to an elegant living space. 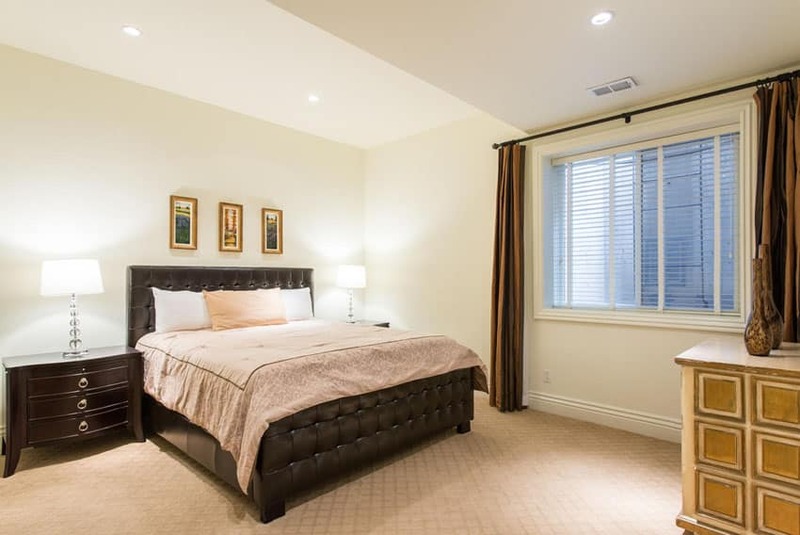 The three levels of this house offer elegant bedroom suites, decorated living rooms, a reading room, a dedicated movie room, a home office, and a basement game room with small kitchen and wet bar. French provincial house design comes from the style of French chateaus or royal manors built by nobles around the mid 1600s during the rule of Louis XIV. With emphasis on architectural symmetry, the French provincial style aims for balance between chimneys, windows and rooftops. French provincial homes often have high steep roofs, elegant porches with balustrades, arched doorways, dramatic balconies, and French windows with shutters. The grand front entry of this French country style home is apparent as you approach the large arched front entrance. Impressive concrete balusters from the front porch and balcony showcase the opulence of this grand estate. A beautifully landscaped garden with carefully manicured hedges, lawn and flower garden greet visitors and make a great first impression. Once inside the front door the French provincial style is displayed with a double staircase with luxurious wrought iron railing, large crystal chandelier and checkered marble floor tiles. Elegant lighting in wall sconces provides a soft glow to welcome guests and give the feeling of distinction and glamour. 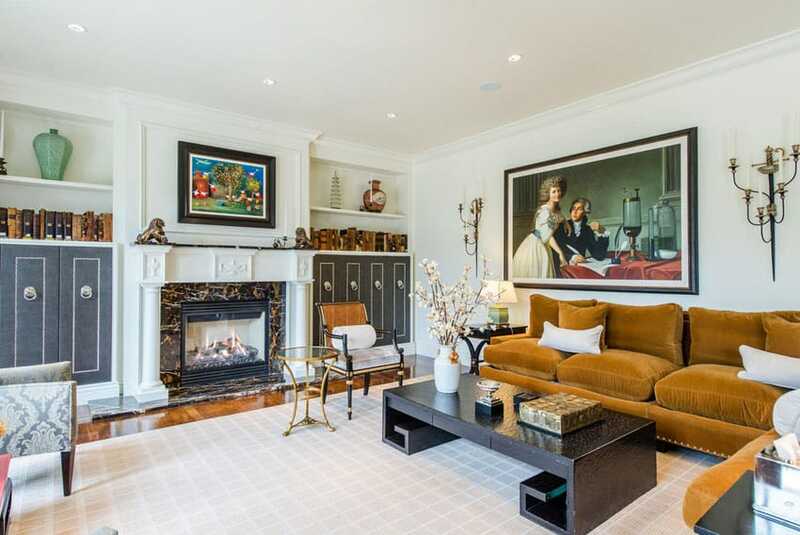 A luxury living room area with classic furniture pieces opens to the backyard through large French doors. Underneath the large area rug lays stunning hardwood flooring that runs throughout the room and flows in to the open concept kitchen. The French Provincial style is shown in the artwork and furniture pieces that recreate the decorative features of the design. A detailed fireplace with pillared mantel makes a lovely focal point and provides warmth and elegance. The luxury mahogany kitchen has deep wood cabinetry, two islands and an open concept design that opens to the living room. Stunning Parisian pendant lighting with chrome finish provide illumination of the two food islands. 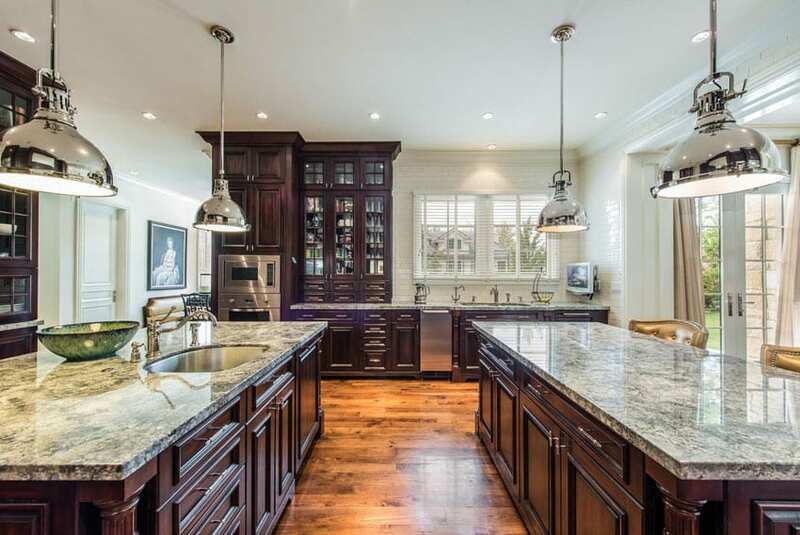 High end stainless steel appliances and glass front cabinetry along with the natural stone countertops makes this a true gourmet chefs kitchen. An alternative perspective of the well appointed mahogany cabinet kitchen with its detailed wood scroll-work and open layout design. 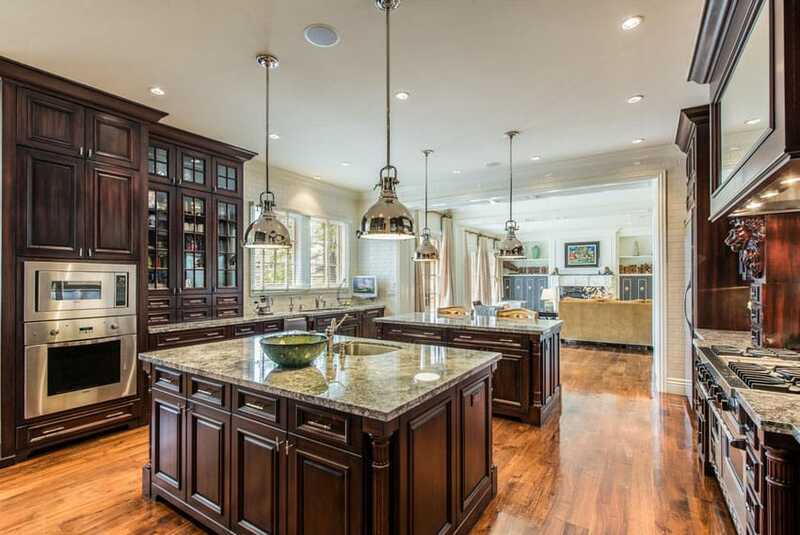 The two kitchen islands provide space for eat-in dining as well as plenty of room for food preparation and entertaining. 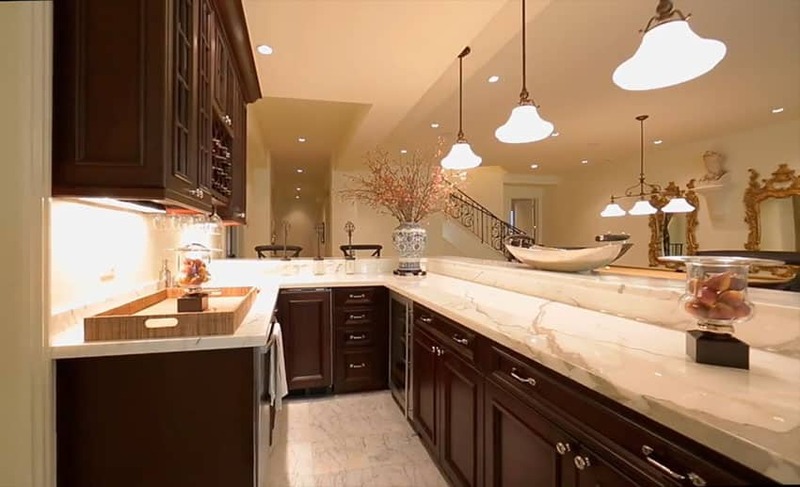 A fine mix of dark cabinetry and light color finishes. 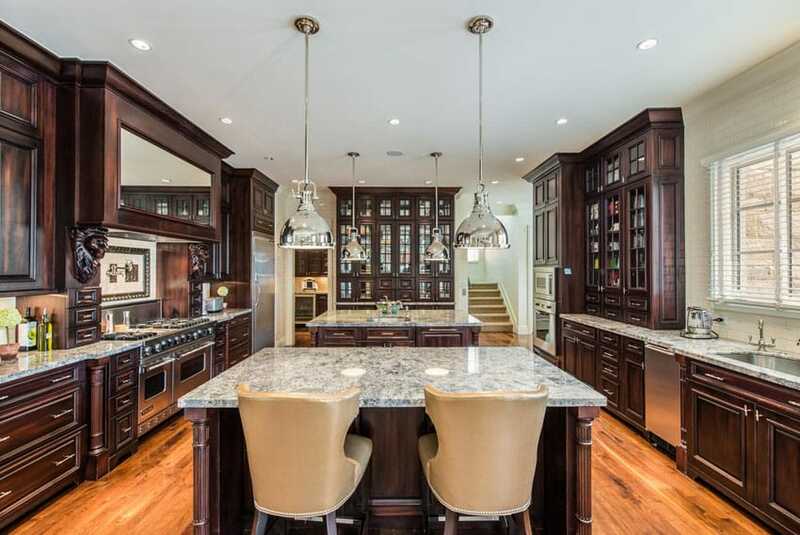 In between the two kitchen islands one can see the fine level of detail and craftsmanship in this lovely kitchen space. White subway tile is visible on the back wall as well additional French doors leading to the backyard. A view from the eat-in dining island with light leather seating and view of the expansive kitchen with its abundance of cabinet space. A separate dining nook with plenty of natural light from many windows provides another space to gather and enjoy this fine home. The nook offers leather bench seating and a continuation of the elegant wood floors. 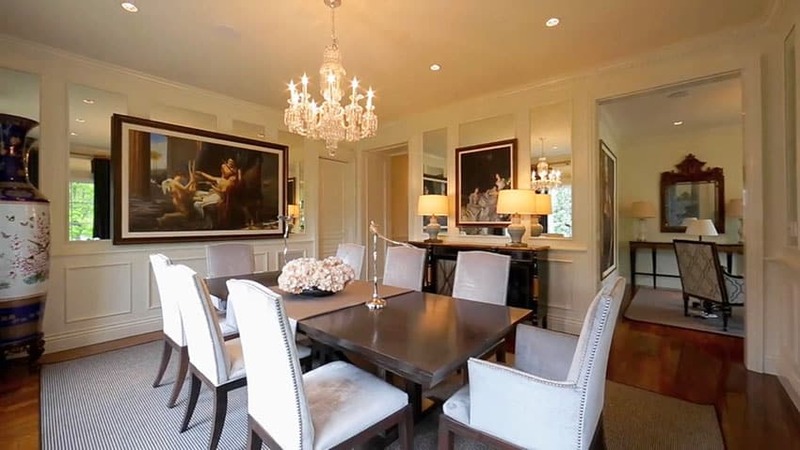 The formal dining room is richly detailed with a crystal chandelier, wainscoting, crown molding and white paneled walls. 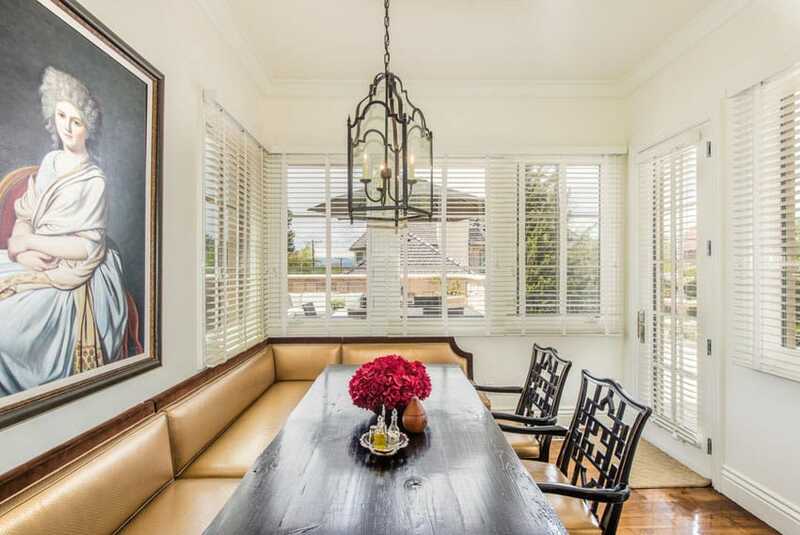 The dining table is equipped with room for eight in this elegant setting. Large windows provide ample natural light and beautiful pieces of art provide the perfect backdrop for socializing with friends and family. From this perspective of the luxury dining room one can appreciate the French provincial style of the space and its luxurious furnishings. A small living room area with marble enclosed fireplace, burnished chandelier and walnut French Victorian parlor chairs makes a pleasant sitting room. The main master bedroom is elegantly furnished with it cream berber carpet, four post bed and French style furniture pieces. An expansive window view looks out on to the home’s gardens. 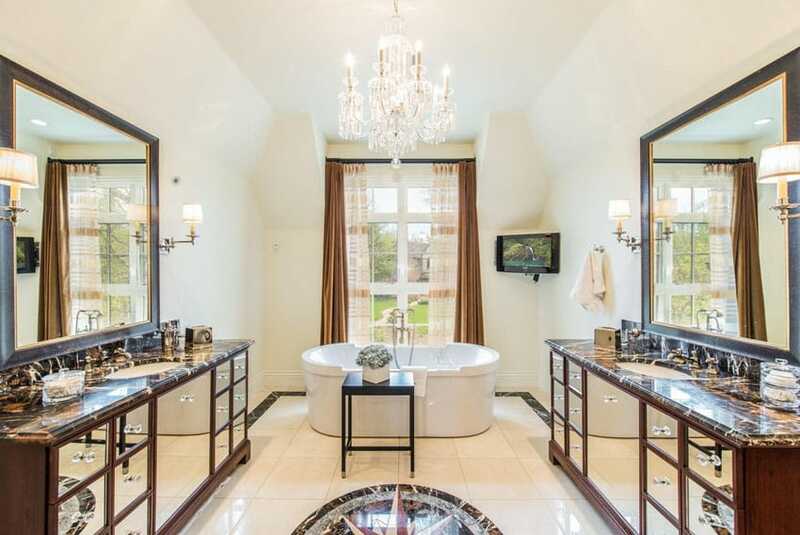 A luxury master bathroom with dual vanities and large contemporary soaking bathtub makes a stunning impression. Travertine tile, glass chandelier and marble counters give the feeling of extravagance and luxury. Take in the relaxing ambiance of the master bathroom suite from the large soaking tub situated under an curtained window. 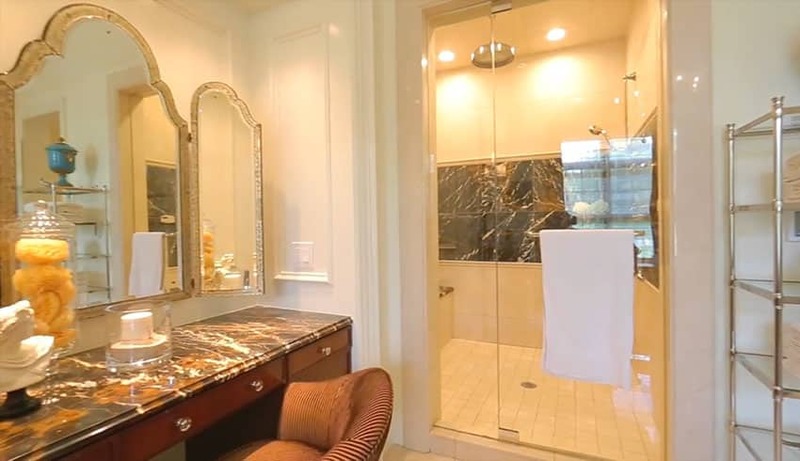 A separate glass shower with dark marble tile inlay and rainfall shower head is an inviting place to start the day. A large marble counter makeup counter is situated to the side with a comfortable chair and silver mirrors. 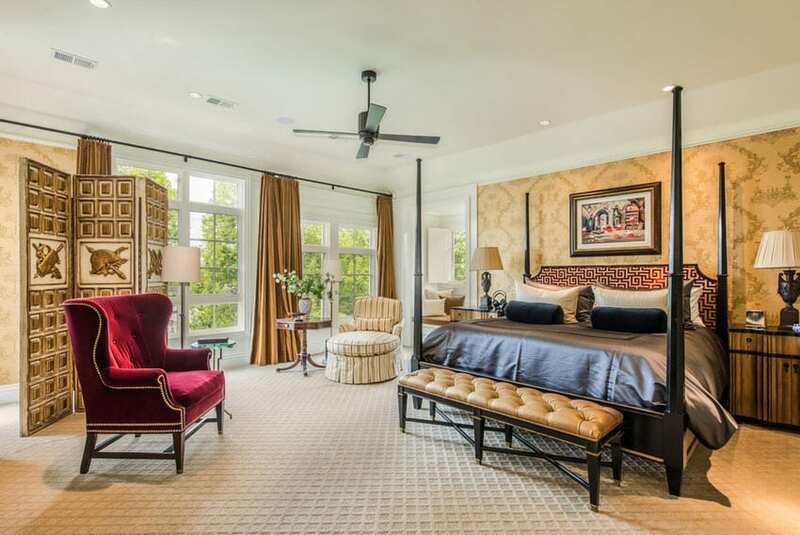 This guest bedroom has plenty of room to stretch out with a view through French doors to the backyard gardens. 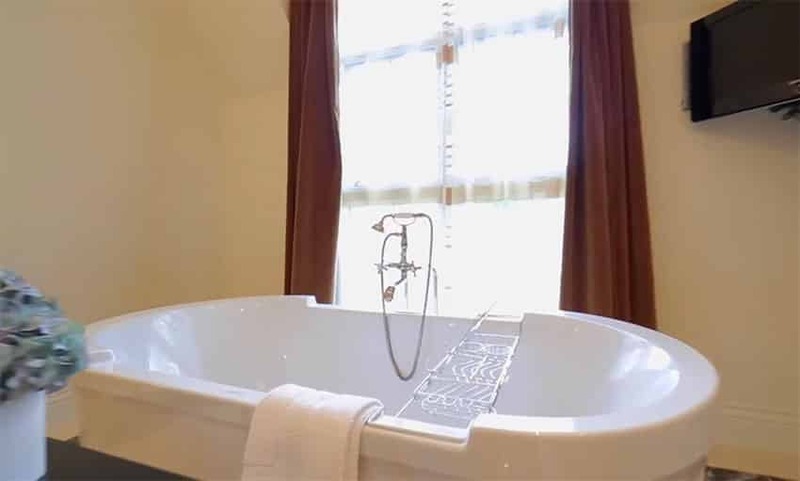 The guest bathroom is equipped with enclosed oval soaking bathtub, dual vanities and frameless glass shower. A guest bedroom with pleated leather bed frame, matching night stand and raised ceiling. A whimsical girls bedroom decorated in white and pink wallpaper with a four post princess bed with sheer curtains. Cute white furniture and French doors leading out to a private balcony make this a perfect little girl’s bedroom retreat. This girl’s room is decorated in striped pink and white wallpaper with a beautiful four post bed with an antique style. Matching white dresser and night stand match the white wainscoting and bed frame. This child’s room is painted in blue with a basic white writing desk and shelving unit. A large window with mini blinds allows in plenty of natural light in to this cheerful bedroom. 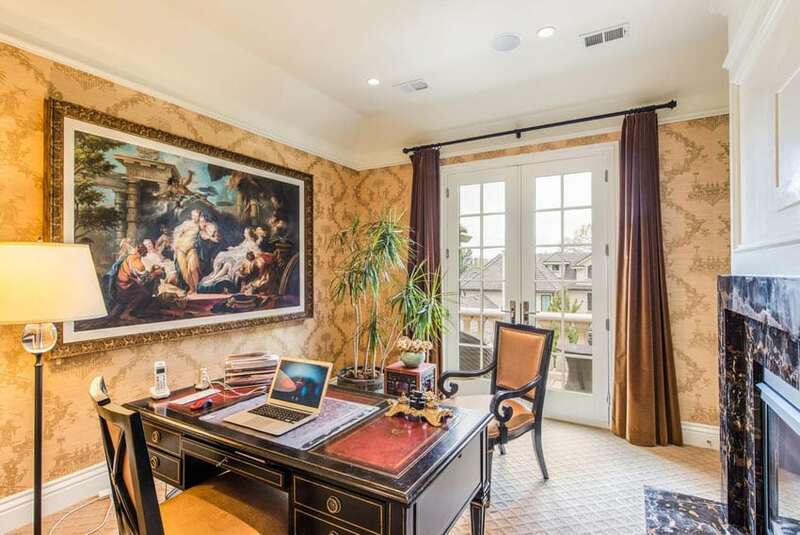 A home office with a large marble fireplace, writing desk, and French classic brown & gold wallpaper. 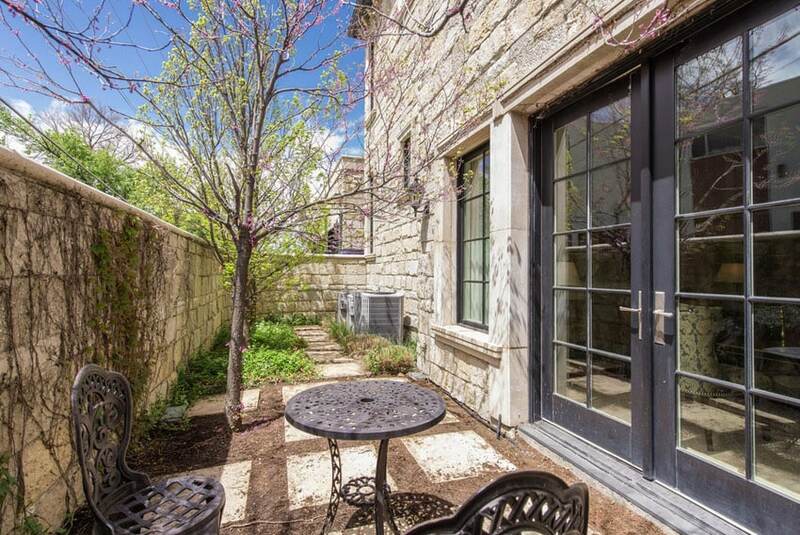 French doors open out to a second story balcony. 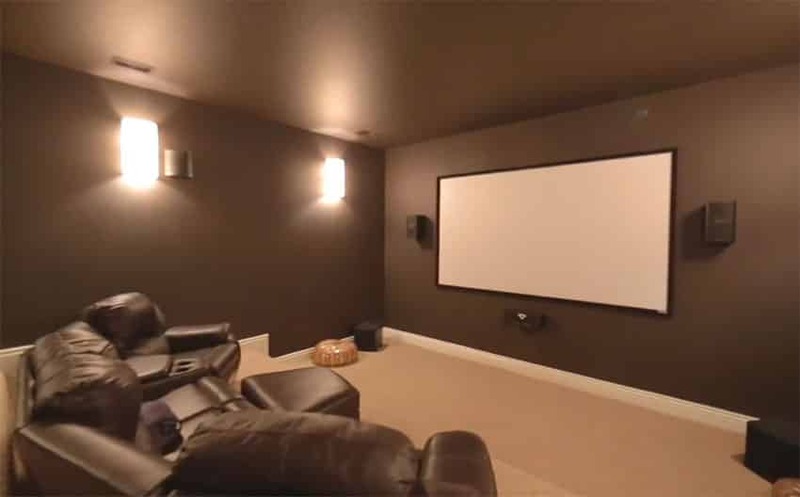 This home’s movie room provides plenty of comfortable leather seating for the entire family with a large projector screen and surround sound audio. 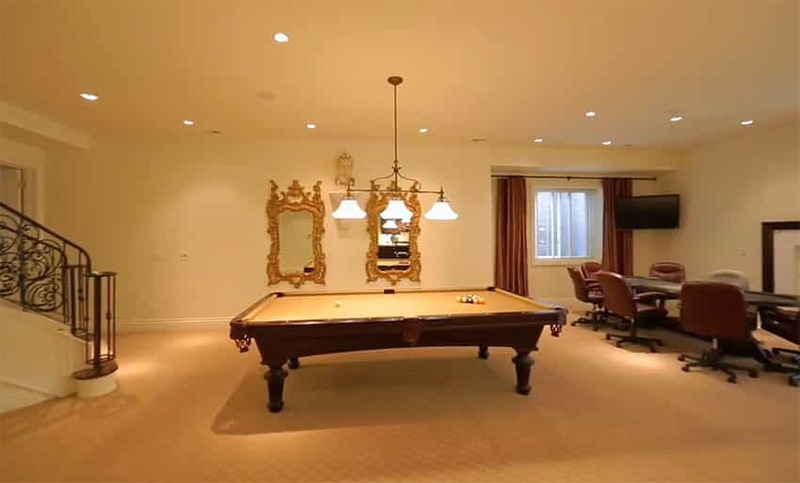 A large basement game room is well equipped with a billiards table, television and large table for playing games and recreation. On the other side of the basement living room is a large wet bar with wine fridge and marble countertops. The cabinets provide plenty of room for food and wine storage. A small paver patio area and outdoor dining table sits on one side of the home next to a rustic stone wall with creeping vines. 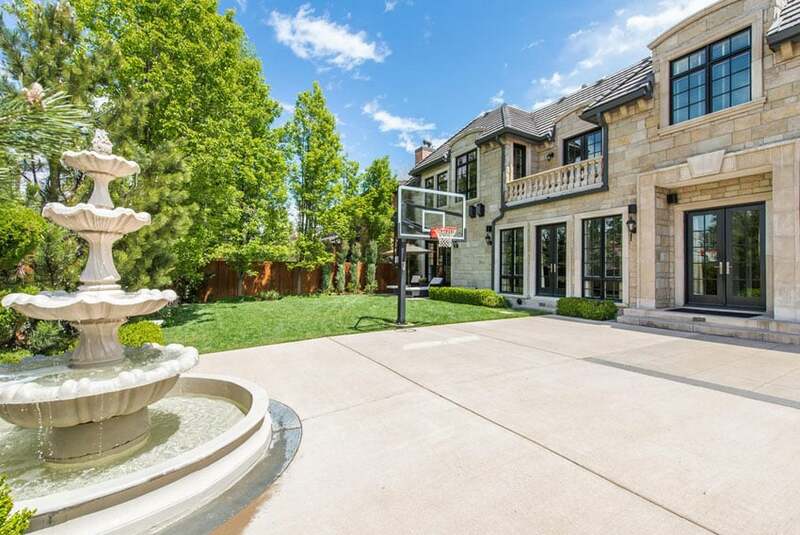 In the back of the French country style home sits a large concrete patio with basketball hoop and large multi-tiered fountain. The patio has a large sitting area for friends and family with a synthetic rattan sectional couch and a dining table with umbrella. French provincial house design is known for its beautiful stone work and attention to detail. Here you can see the intricate stone work on the exterior of the home. French doors lead out to the main concrete patio area. A backyard lawn area surrounds another small patio with room for two lounge chairs under a shading umbrella.